As requested, there is now an ubuntu-dark theme for Ubuntu's screen-profiles. This allows you to choose between light-on-dark, or dark-on-light colors for the window panel and the status panel across the bottom of your screen. 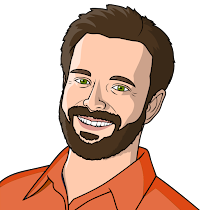 Thanks to Tyler Willingham for the suggestion and the patch/branch in Launchpad. Hi Dustin. I think these screen profiles are fantastic - certainly come in very useful, and the helper tool to set up automatic screen is great. One question though - is there an easy way to disable the F-Key shortcuts? 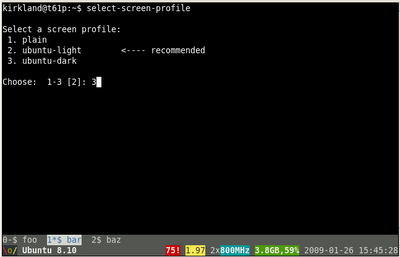 I use htop, which has it's own F-Key mappings - but screen takes them over. Cheers.